We specialize in small group of women climb at a reasonable cost. Not a cheap Kilimanjaro climb, but a great value for everything you need to have a safe, successful experience. We are among Kilimanjaro’s top local operator . Won’t you join us on 10 days Lemosho route women only to Kilimanjaro on full moon summit? 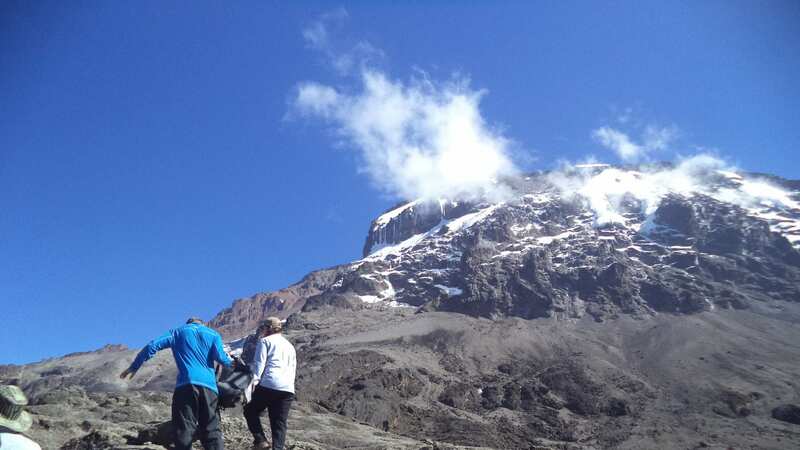 Price: US $2950 per lady for the 10 days Kilimanjaro Trek only. Price: US $4750 per lady for both Kilimanjaro Trek and Serengeti Safari. Route to the summit: Lemosho Route. Trip Length for lady who will Trek only: 10 Days (8 Days Trekking + 3 nights Hotel, 2 nights before Climb and 1 night After Climb). Trip Length for lady who will do both Trek and Safari: 14 Days (8 Days Trekking + 4 night Hotel, 2 nights before Climb and 1 night After Climb and 1 night after Safari). End of Trip for lady who will Trek only: 21st July 2019. A 30% DEPOSIT NON REFUNDABLE IS DUE AT TIME OF SIGNUP TO RESERVE YOUR SPOT. Lemosho follows the same route through Lava Tower, Barranco and Barafu, known as the southern circuit. Descent is made via the Mweka route. Arrive at Kilimanjaro Airport (IATA code: JRO). Eco-Africa Climbing representative will be there to collect and transfer you to your hotel in Moshi. The hotel check in on this day will be from 11 am East Africa Time. This day all women will meet and get to know each other and visit Moshi town. In the evening our mountain guides will provide briefly about the Mountain and inspect all the gear. The day begins with a long drive to Londrossi Park Gate (2100 m) for registration. Pass through village communities to the trailhead to start hiking on the route along a narrow forest path to reach Mti Mkubwa (Big Tree) campsite (2800 m). Trekking Time: 2-3 hours ⎟ Distance: 5 km ⎟ Altitude Gain: 411 m.
Accommodation: Camping at Big Tree Camp Camp. Leaving the forest, the trail gets steeper as it enters the moorland zone towards the valley. A gentle grade walk takes you across the high altitude Shira Caldera past Shira Cave (views of Arrow glacier) at 3500 m and then gently downwards to Shira Hut 1 located near a stream on the Shira Plateau. Trekking Time: 3 hours ⎟ Distance: 8 km⎟ Altitude Gain: 719 m.
Accommodation: Camping at Shira Hut 1. A gentle hike across the plateau within the moorland meadow takes you to Shira Hut 2 for the afternoon and overnight. Many hikes are available on the Plateau, making this a great day for acclimatization. sickness by aiding your bodies in acclimatization. Start the day by descending into the start of the Great Barranco, a huge ravine. Then exit steeply, up what has been termed the Breakfast Wall, which divides you from the southeastern slopes of Kibo.It is a climb over rocks, although not technical. Passing underneath the Heim and Kersten glaciers, head towards the Karanga Valley (4000 m) for overnight. Trekking Time: 2-4 hours ⎟ Distance: 4 km⎟ Altitude Gain: 600 m.
Trekking Time: 6-8 hours ⎟ Distance: 7 km⎟ Altitude Gain: 1296 m.
Trekking Time: 6-8 hours ⎟ Distance: 12 km⎟ Altitude Loss: 2896 m.
crossing the Masaai Steppe and the Ngorongoro Conservation Area, entering the Serengeti via Naabi Hill Gate. Wake up for a full day of game drives in the Serengeti plains with picnic lunch taken at one of the designated sites, or if you wish you can do an early morning game drive then go back to the Lodge/tented camp for breakfast then relax until in the afternoon. You can then go for a sunset game drives in the plain. and eventually equally good views towards Olduvai Gorge, the Serengeti and the Gol mountains to your left. This is an easy-paced walk with no arduous climbs, just a few short gradients. It lasts about 2 hours and can be done at any time of day. Very early morning we drive down the Ngorongoro Crater walls to the Crater floor where we will spend the better part of the day doing game drives in this 8th wonder of the world also referred to as the Eden of Africa. Here we will get the chance to spot the animals that we might have missed at Serengeti with a little luck you can spot the Big 5 that is; Elephants, Lions,Leopards, Buffaloes, and Rhinos, in a single day‟s game drive. Sleeping mattress pad(s), dining tent(s), sleeping tent(s), and crew‟sequipment-Dining tent and sleeping tent for Kilimanjaro trek. 3 nights in a hotel in Moshi Double Occupancy based on a Bed & Breakfast basis (2 before trekking & 1 after trekking).The hotel check in is from 11 am and checkout is at 10 am EAT. Menu especially designed for climbers(Breakfast, lunch, and dinner, as well as hot drinks on the mountain). Guide – $15 to $20 per day. Assistant Guide – $10 to $15 per day. Chef – $10 to $15 per day. Porters – $5 to $8 per day per porter.